3D Album: Stereo Aids - Manufacturers of Mirror and Pocket Stereoscopes. Publishers of 3D Imagery. When a Hand Held ScreenScope is purchased! 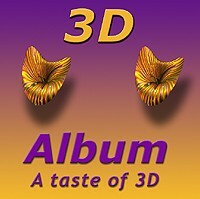 3D Album's easy to use interface allows you to browse the image by category or keywork search. With the ScreenScope users are able to enjoy viewing the selected image in true 3D comfortably. It beats going cross-eyed!! This sculpture is located in the centre of Rundle Mall in Central Adelaide. Generated by Tony Bignell using POV-Ray. Koala Bears are one of Australia's unique animals. A replica of one of the first ships to visit Australia's shores. The above samples are best viewed at 800 x 600 screen resolution. Use the centre dividing line to adjust the image separation.